Given my adoration for cobblestone streets, quaint shopping, locally-caught seafood and seemingly endless beaches, it is hard to believe that I had never ventured to Nantucket until a few weeks ago. I mean, with plenty of places to sneak away to during our short summer season here in New England, why make the haul (a long car ride, ferry trip, etc.)? Now that I’ve had a taste, the answer is simple: Nantucket is the gold standard of charming coastal life and leisure. I work for a studio here in CT and NY called Forme Barre Fitness (formerly known as Go Figure) which lucky for island tourists/residents—ahem, and staff members like myself—also has a gorgeous Nantucket location! So when my rockstar boss invited our team to support their busy season in studio and on the beach with our Barre Bus this summer, I could not raise my hand fast enough. Get ready for a challenging class that will burn off last night’s cocktails—and then some. Like the rest of our star-studded instructor squad, the ACK gals are talented, charismatic teachers! And barre on the beach? Yes, yes and y-e-s. 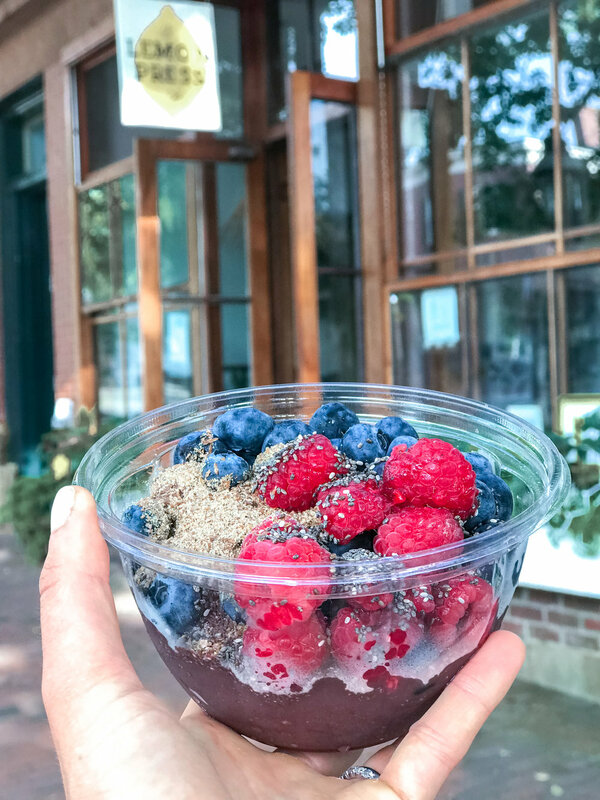 Lemon Press: Located conveniently right downtown, this Instagram-worthy cafe has smoothies, sandwiches, all things avocado toast and a plethora of other healthy grab-and-go essentials. I definitely want to check our their sit-down dinner next time we visit! You MUST get your hands on their Hummus Wrap and Açaí Bowl. So filling and delish! Keepers: Conveniently located down the street from Forme, this cute and casual spot has a menu everyone will enjoy and a friendly atmosphere to boot. Mike and I both ordered the Favorite Veggie Bowl topped with seared salmon and holy cannoli it hit the spot after a long day of teaching and fun in the sun! Millie’s: Ask any Nantucketer their favorite restaurant and Millie's will hands down be topping their list. Why? The right off-the-beach easygoing dining and coastal fare embodies the true spirit of summer. Dockside New England favorites mingle with California Baja-style fish tacos and quesadillas for a satisfying comfort food without leaving you feeling bogged down for tomorrow's bikini. After catching a gorgeous sunset, Mike and I dusted off our sandy feet and enjoyed a cocktail at the lively bar pre-dins. Not surprisingly enough, Mike ended up noshing on the Brant Point (a quesadilla loaded with grilled shrimp, pineapple mango salsa, zucchini, jack and chihuahua cheese) while I dove into the Moors End Farm Salad full of local ingredients like summer squash and corn. Island Coffee Roasters: In my ideal world, every A.M. would start with a waterfront stroll—a cup of Joe from [my] local coffee shop in one hand, Mike's hand in the other. Our last day on the island started with just that, thanks to this cute, somewhat hidden gem, located steps away from the ferry port. Cisco Brewery: Like Millie's, Cisco Brewery is a must-visit Nantucket destination. "But, I'm not a big beer fan." Babe, I got you. Cisco is more than just a brewery! With a winery and distillery on the property, you can enjoy all of the refreshing, summer fun awesomeness—including live music, food trucks (oysters on the half shell? I'm in) and more. Done! Brant Point Lighthouse: A historical and highly recognizable Nantucket landmark, Brant Point Light is a stunner and one of the first things you see as you pull arrive on the island from the ferry. A must for photo-opps, especially at sunset! Sankaty Head Lighthouse: A symbol of the island, Sanity Head Lighthouse sits atop the highest point of land, the Sankaty Head bluff overlooking the Atlantic Ocean. We drove to visit this classic Nantucket scene, however next trip I will be dragging Mike there via bikes, as I heard the Siasconset trails are divine! Pocomo Point Beach: Pocomo Point's calm, warm waters (given it's mid-way from the harbor to head of the harbor location) make for an oh-so inviting playground for kayakers, windsurfers and kiddos alike. Mike and I snuggled up on a blanket together and caught a gorgeous sunset here on our last night! Stunning and romantic.